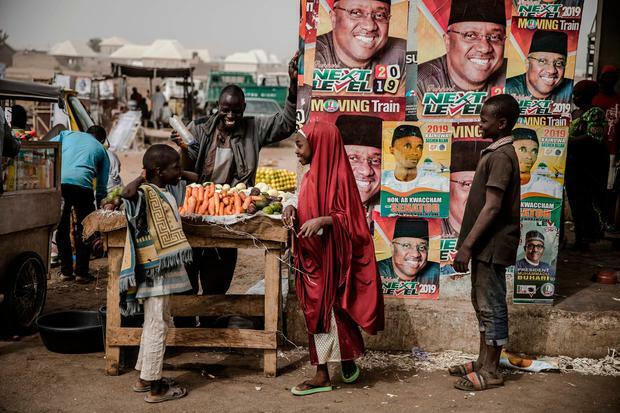 Nigeria bolstered security in much of the country yesterday on the eve of a presidential election in Africa’s largest democracy where past ballots have been marred by violence, voter intimidation and vote rigging. The two leading candidates in today’s vote are President Muhammadu Buhari, who took office in 2015, and Atiku Abubakar, a businessman who served as vice president from 1999 to 2007. The country, which has Africa’s largest economy, is dealing with pockets of instability: authorities are trying to tackle a decade-long Islamist insurgency in the northeast and communal violence between farmers and nomadic cattle herders in central states, along with banditry and kidnappings in the northwest. Dozens of combat policemen and members of other security forces were deployed from police headquarters in Maiduguri, capital of Borno state that has been worst hit by Boko Haram and its off-shoot, Islamic State in West Africa Province (ISWAP). “There are about 14,000 security personnel deployed for the election purpose. This deployment also includes 11,000 policemen,” said Borno’s police commissioner, Damian Chukwu. Military vehicles and soldiers were seen moving toward volatile parts of the state, which has seen an uptick in attacks by ISWAP in recent months. The group said it carried out an attack on the convoy of Borno’s governor earlier this week. In Kano, a hotly contested state that is the economic hub of the north, police said at least 15,000 officers would be deployed for the election with a further 5,000 from other services. That compares with just over 10,000 officers on duty on a normal day. Muhammad Wakili, commissioner of police for Kano state, promised a “violence-free” poll. Kano is the most populous state in the northwest, a region that accounts for nearly a quarter of Nigeria’s voters. It has been a Buhari stronghold in the last three elections and his posters outnumber those of Mr Atiku. In Adamawa, Mr Atiku’s northeastern home state where he will vote, a police spokesman said more than 7,500 officers had been deployed, significantly more than the usual number on the streets. Mr Atiku spent much of the day in meetings with members of his party in Yola, the state capital of Adamawa. Mr Buhari worshipped at a mosque in Daura, his hometown in the northwest, which sits near the border with Niger.